We travel through Spain, Gaul, Italy, the Balkans, Anatolia, the East and Persia to uncover the geo-political situation in 600AD. 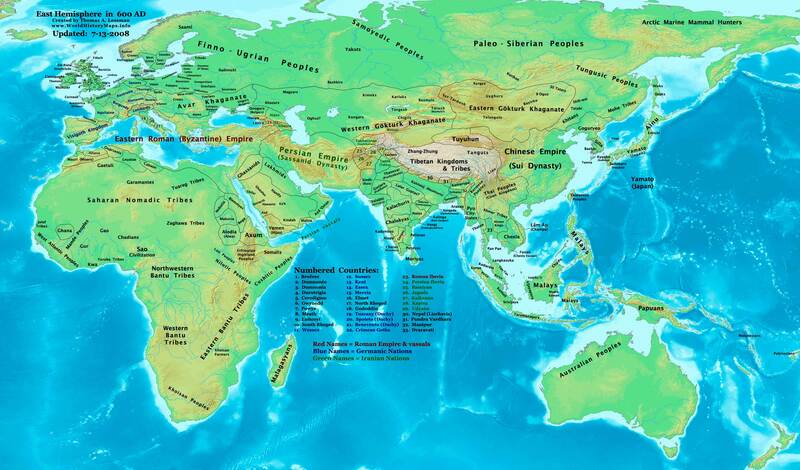 Map: The map shows the political distribution of states and nations around 600 AD. At one point (25:20, or thereabouts) you are discussing cults and such in the Arabian Peninsula and you say: “you can see where I am going with that one”, but I’ve listened to it several times and I can’t see where you’re going. Do you mean the cults were important in the downfall? I fear I missed your point. Could you explain? Hey, I just meant to foreshadow the rise of Islam. The area had a wide variety of religious practice and Mohammed would come from that background and unite them all. A! D’oh. Makes complete sense now. Thanks for replying. And thanks again for producing the podcast. It is definitely in my current top ten. Another question: do you have any recommendations for books which explore the interactions the Muslim empires had with the Byzantine empire? The Islamic expansion is a real gap in my knowledge and I’d be interested in filling it in. Thanks again for the podcast. An advance reading list, of sorts? Sounds good. Any titles you’re planning to read would no doubt be a good place to start. are three I will be getting too. Depending on how comprehensive you want to get the Cambridge Medieval Histories are supposed to be thorough and I’ve found links to where you can read the post Heraclius stuff. I will be updating the bibliography as I read more. That is really helpful. Thank you.